Prostate cancer is something that most likely we have all heard of. But do we really know what prostate cancer really is? The prostate is a gland that is only found in men. It is walnut shaped and its’ “job” is to produce seminal fluid that transports and nourishes sperm. 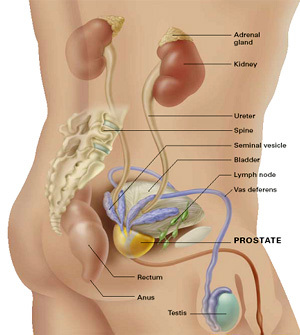 Prostate cancer is one of the most common cancers found in men. Men with family members that have had prostate cancer are at greater risk. The incidence of prostate cancer also increases with age. Most prostate cancer grows slowly and is confined to the prostate. Since there are typically no, or very minor symptoms, men need to be examined for the presence of prostate cancer regularly, as early detection is the key to survival. The treatment that you will be given, if you have prostate cancer will be determined by the stage of the cancer, as well as your life expectancy, since this type of cancer can be very slow growing, and is usually contained within the prostate. High Intensity Focused Ultrasound, also known as HiFU, is often a treatment option. HiFU is an ultrasound treatment that is performed by placing a transrectal probe near the prostate, and then using ultrasound wave energy to destroy the cancerous tissue in the prostate. This procedure is typically done either under anesthesia, or with a spinal tap, and may last anywhere from one to four hours. A catheter will need to be placed into the bladder for one to two weeks, due to the swelling that may occur; you may notice temporary burning and difficulty in urination, once the catheter is removed. These issues should resolve themselves quickly, leaving no further complications. The use of HiFu is not the only option when treating prostate cancer, and not every patient will be a candidate for HiFU, but if it is an option for you, you will be pleased to know that the risks of incontinence, impotence, urethral stricture and rectal fistula are relatively uncommon, making this a welcome choice for prostate cancer victims. HIFU Animation from Keith Schilling on Vimeo. HIFU is a treatment designed to treat localized prostate cancer using high intensity focused ultrasound. HIFU technology is similar to the scientific principle that allows sunlight focused through a magnifying glass to burn a leaf. The ultrasound waves, like the sun's rays, are focused into a single intersection point called a focal zone. At this focal zone, temperatures are raised quickly to the point of tissue destruction. This is highly accurate and repeatable, and the entire process is monitored in real time.